Psych! The infusion company was supposed to overnight the saline they forgot to send along with my IVIG. The nurse arrived and it still wasn’t here, so I called for tracking information. They forgot to send it. My infusion will now be tomorrow at 7:30AM. I’m hoping I’m over the side effects by Monday when I have an appointment 2 hours away. I definitely will be calling the infusion company again tonight to confirm it was sent! Yay. The saline came today. We infused that around 8AM then started infusing the IVIG. I took a 2 hour nap and am now nearly half done with the infusion. All done! It went smoothly. We stayed at 50mL/hour this time since at 70 last time, it seemed like my headache was worse. That post from my Facebook page sums it up! I laid down at 5PM yesterday and woke up at 11AM today. I guess this will be the round of IVIG where we see if 18 hours of sleep is what it takes to evade side effects. 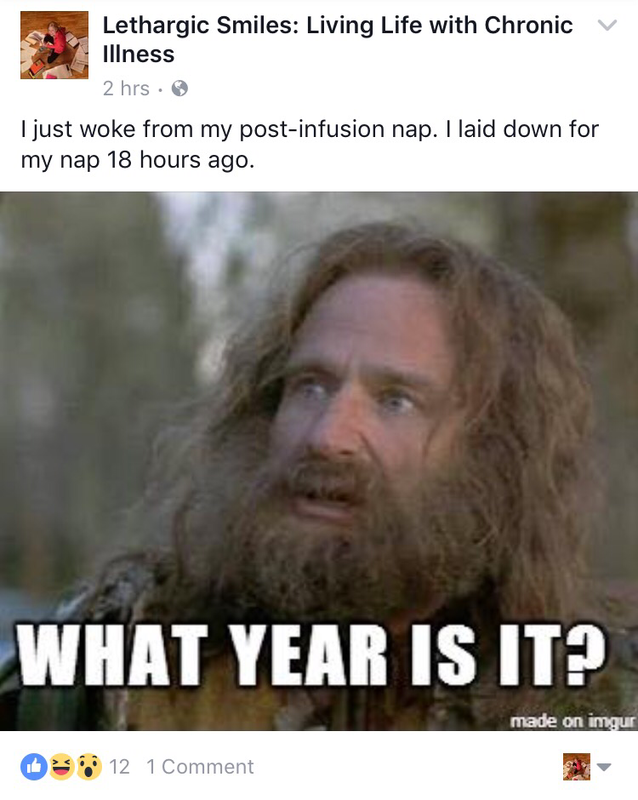 I feel how I usually do the day after infusions. I’m a bit tired AND feel like I could be getting a headache, but overall, I feel my version of normal. There’s some added stiffness from sleeping so long, which I am about to go stretch out! I will post again tomorrow, if not sooner. We did my regular IVIG infusion rate (50mL/hour) with 1 liter of saline infused before IVIG and another after. I took NAC (n acetylcysteine), a supplement I added a few infusions back in case it might be helpful with evading side effects. I don’t think it is. I’m thinking the 18 hours of sleep is what did the trick. Either that, or my body has gotten used to the IVIG. I promised myself I would rest a full 2 days after the infusion regardless of side effects. Even though my husband got off work early today and it was tempting to get out of the house, I still stuck to my plan to rest. Hopefully I’m rewarded with no surprise/delayed side effects! I already cannot do as much as a healthy person my age (or even twice my age) can do in a day, so losing most of every other week to infusion side effects has been very frustrating. I’m still fine! Yesterday I got a baby IVIG headache but nothing that interfered with life. If I didn’t know it was from IVIG, it wouldn’t have even been notable. I was still too tired to go out anywhere, but my parents stopped by for a visit. I gave my hair a deep conditioning treatment, washed it, and shaved my legs (other people with POTS will relate to this much time with arms above head plus warm water being notable). I had a fun day because I wasn’t feeling too sick, the IVIG fatigue was gone, and I got to be with my husband all day long. Our day revolved around my appointment with my autonomic neurologist ~2 hours away which I’ll post about later this week. (Hopefully – I know I tend to miss posting!) My symptoms are always there, but didn’t bother me too much until the evening, and there were moments here and there in the afternoon where no symptom was taking up as much (or more) attention as whatever I was doing (singing with the windows down). Now I feel awful from enjoying my “health” so much today, but that’s okay – it will pass and I’m grateful for the day I had. I have a little over a week before infusion #7. I hope it goes as well as #6. For this infusion, I only required two doses of Tylenol, and 1 dose of ibuprofen. To compare, I was taking both Tyelenol and a NSAID as often as I’m allowed for 4-5 days following previous rounds. Disappointing. You probably had it all planned out! I love you too! So glad you had a nap again today during the infusion. That is progress. Sending hugs.